I really wish I had a picture of this! Ali stood up yesterday by himself! I mean, it was only for a few seconds. Then he folded over sideways onto his bed like a drunken sailor. And his back legs were not in a normal position (they were too close together and kind of in a line, one behind the other), BUT he pushed himself into a standing position all by himself!! I was gathering my things to leave work at the end of the day and Ali was being his usual I-know-we’re-getting-ready-to-go-somewhere restless self and I turned around and he was actually standing up on his bed. Aghast, I said “Oh my god – are you standing up? ?” I wish I had my camera ready, but I didn’t. I don’t think I would have had time to snap a picture anyway. Needless to say, I was thrilled and he looked pretty pleased with himself! 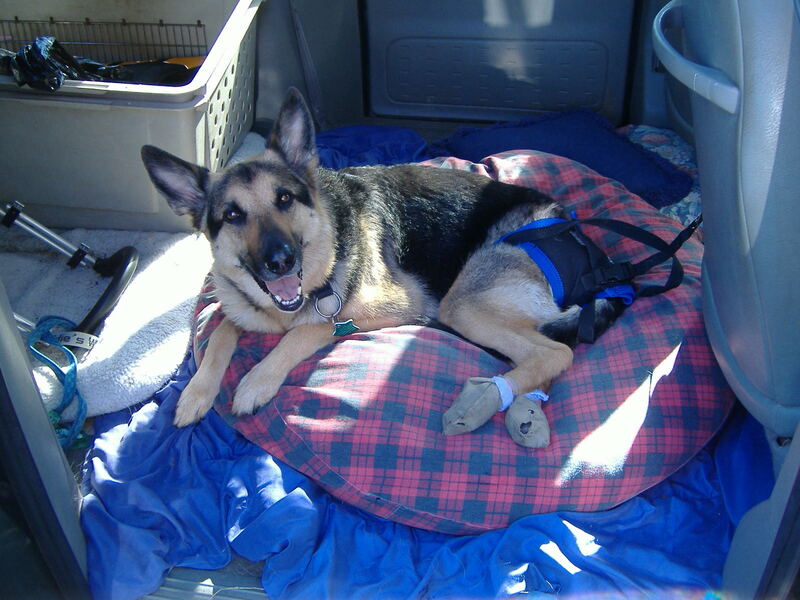 Lately he has been doing a good job pushing himself up with his left leg to change positions on his bed and a few times it looked like he was trying to stand for sure. But this is the first time he has actually succeeded. And I think that’s awesome…even if it was just for a few seconds!! After Ali’s first successful session with the underwater treadmill, the plan was to go back once a week, gradually increasing his time in the hydrotherapy tank. I guess Ali decided he did not like that plan, because the next time we went back he refused to walk. Juli, the therapist, would not struggle with him, saying it is not good if he is fighting it. So we left and, feeling disappointed, I cancelled our remaining appointments. Ali had done so well the first time; I had really high hopes! But for some reason he was feeling stressed the second time. Because I had mentioned Ali liked to go swimming before his injury, Juli suggested an alternative to the hydrotherapy tank: taking him to a river to see if he would swim. So that weekend Kevin and I took him to the Napa River and, despite some stress getting him up and down an unexpectedly steep embankment and navigating the ridiculously rocky river bottom, it went really well. I started off slow, letting him wade (me holding his back end up) and then I gently tossed a tennis ball to see if he wanted to swim and he did… he was even kicking with both his back legs! Each week since, I have taken him to Johnson’s Beach on the Russian River in downtown Guerneville, usually with a friend or three in tow, to swim for about 20 minutes. The Russian River is much better suited to the purpose of therapeutic swimming; it is flatter with a sandy bottom. 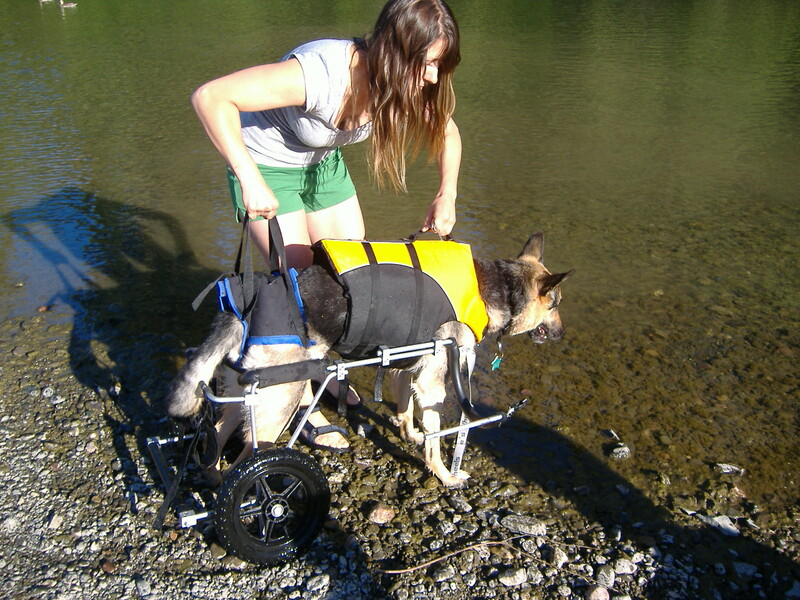 Once we arrive, I load Ali up in his wheelchair and let him wade around with his wheels in the shallow water for a few minutes. 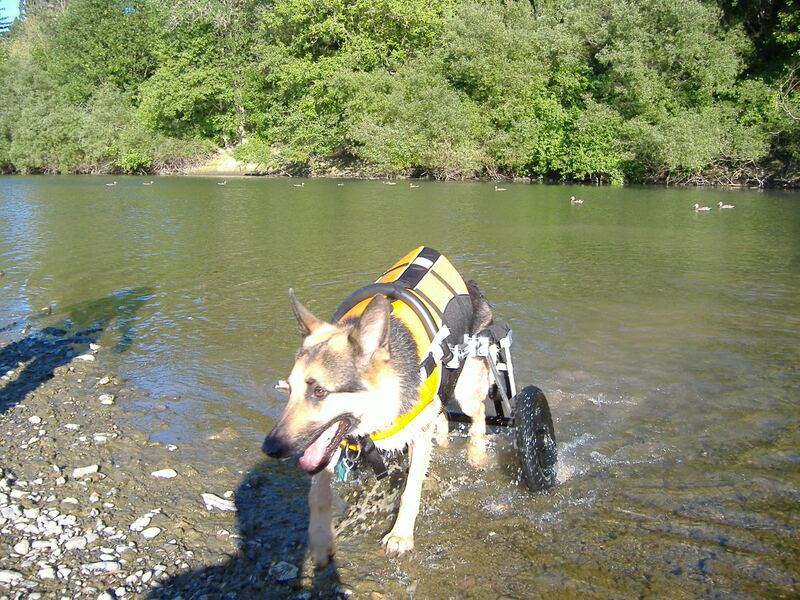 Then I take him out of his wheelchair and, holding onto his “float coat” (life vest thingy) with one hand and rear harness with the other, I walk him into the water until it is deep enough for him to not touch, and then I toss a tennis ball until he seems like he is getting tired. At first we did this for 10 minutes but I have gradually increased the time to 20 minutes. I always expect him to crash after all that exercise and I need to be careful he does not overdo it, but surprisingly he never seems tired afterwards! Juli says anything that gets his back legs moving is excellent therapy, and swimming is great cardio and good for him psychologically. So that is Plan B. Out with the treadmill, into the river…stay tuned!